Note: The 2011 Atlantic Hurricane Season outlook has now been posted in the “Long Range Outlooks” page, along with a brief overview of the rest of this summer. The clouds and storms that have occasionally affected the area over the last 3 days are now ending as the cold front is currently moving through. The warm front was south of the expectation, stalling in central New Jersey, resulting in temperatures colder than expected, only peaking in the mid 70s in the western parts of the area, upper 60s to lower 70s in the immediate NYC area, and in the mid to upper 60s in Long Island and southern Connecticut. With the stalled front stretching from central NJ to the border between NJ, PA and NY, storms stayed away from the area as well, with storms staying to the north, west and south of the area. The cold front moving through will actually help bring more sustained warmth into the area. With more sunshine tomorrow along with a west wind, temperatures will be much warmer than today, reaching the mid 70s to lower 80s from NYC and further west, and in the lower to upper 70s in Long Island and southern Connecticut. Near to slightly above average temperatures will persist through the rest of next week, and there are indications that temperatures may return into the 90s by next weekend. With the cold front out of the area, more sunshine will return along with a west wind. Although the 850 mb temperatures will be slightly cooler than those of today, the previously mentioned conditions will allow temperatures to be warmer than those of today, with high temperatures reaching the mid 70s to lower 80s from NYC and further west and the lower to upper 70s in Long Island and southern Connecticut. As the low pressure will still be near the Northeast, however, scattered thunderstorms are expected across the interior Northeast, especially in eastern New York and New England. It is possible that some of these storms may get as far south as northern New Jersey, and I placed a 40% chance of rain on Saturday afternoon and evening in the 5-Day Forecast. A week ago, I expected this week to end up warm, with temperatures well into the 80s. The warm front and the position of the low pressure, however, prevented this from happening. Unlike this week, when issues with the warm front placement prevented the area from seeing the warmth that was originally expected, there will be no such issues next week, with the only factors that may limit warmth being cloud cover and potential storms on Tuesday afternoon and a trough on Wednesday/Thursday. Even with these potential issues, high temperatures will be much warmer than those of Wednesday through today, with temperatures in the immediate NYC likely ending up in the mid to upper 70s in the coldest case scenario. 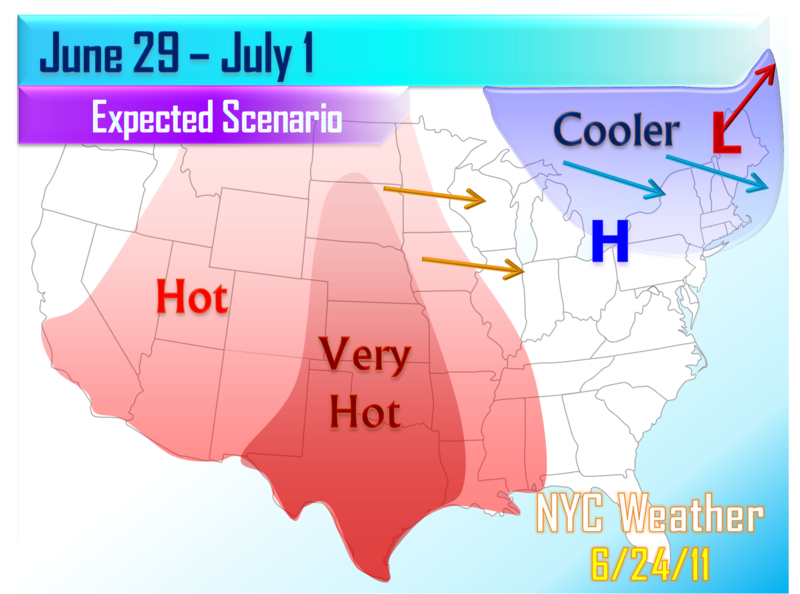 Temperatures will slightly warm up on Sunday and Monday, peaking in the lower to mid 80s from NYC and further west and the mid 70s to lower 80s in Long Island and southern Connecticut. A warm air mass will reach the area on Tuesday from the southern US, with 850 mb temperatures near 18c, but this warmth will be short lasting as another cold front approaches the area. There is still some uncertainty with the exact timing, but the overall idea is there for warmer temperatures on Tuesday, reaching the mid 80s from NYC and further west, with mostly cloudy skies and scattered showers and thunderstorms, some of which could be strong or severe. The best risk of storms should be in the overnight hours of Tuesday, though some storms are still possible on Wednesday. Once this cold front moves out of the area, a trough is expected to move into the NE, slightly lowering temperatures. The 18z GFS develops a cut off low near Maine, resulting in a strong trough sticking around the region through the rest of the first week of July, and while the trough could stick around slightly longer than expected, the GFS is likely overdoing the cut off low, and its own ensemble mean goes against this solution as well. At the same time that the trough is over the region, a massive ridge will begin to build in the central US, with 850 mb temperatures getting into the 30c range outside of the Rockies, potentially resulting in record highs in those areas. 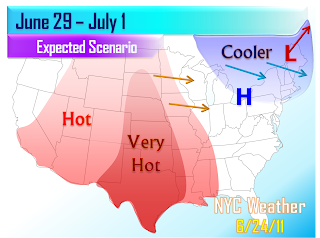 While the worst of the heat will stay to the west of the area, a moderated version of this heat may affect the area on the weekend of July 2-3. More information on this has been posted in the Long Range Forecasts page below the hurricane season/summer outlook.